Elisabeth and George Three came in from the car lugging some hot gifts for my dear wife Karen and I this holiday season. Our Family Reunion week in Kona will forever tie us in the greatest of ways. 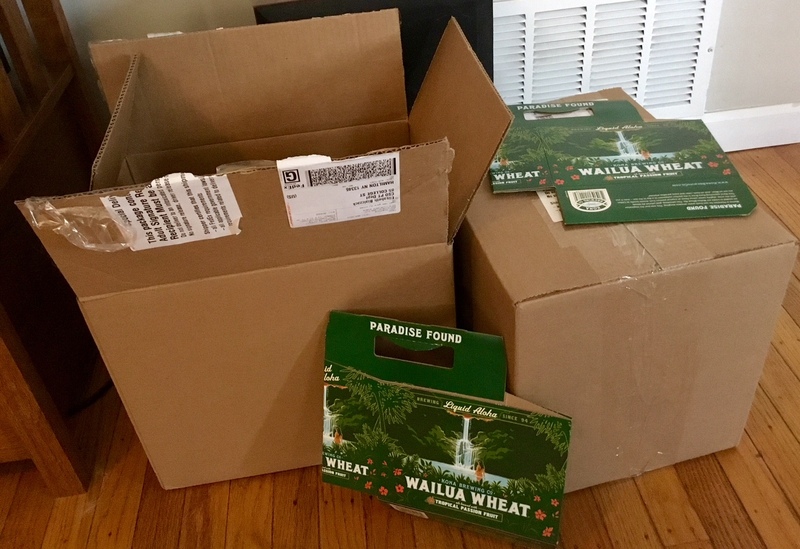 The kids obviously knew how much the old man loved Wailua Wheat. They went online to find a site that would ship them a case. We know from what they told us on our Kona Brewery tour that they brew the bottled stuff in the states. Still, this particular version of Kona is not found anywhere in New York State, so I had reconciled myself to a sad separation. I quickly placed three in the fridge, and my dear wife Karen, George Three and I had our tasty reunion an hour later. Elisabeth isn’t a beer fan of an sorts. At least she knows one when she sees one. The shipping, by the way, was faultless, a dozen bottles per box, with the six-pack holders included for great effect. Merry and Happy for weeks, I am. amazing – your family is so good at gifts! The more time goes by, the better, Beth!